One night last week, an old high school friend on Facebook was describing her supper, which consisted of vegetables she'd grown and canned or cooked, all polished off with a glass of sweet tea. 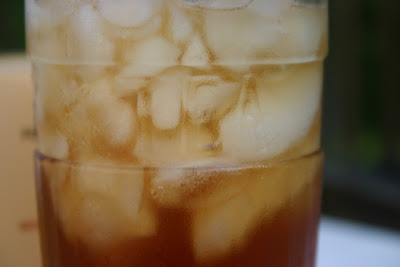 I think if I were on death row and asked to order my last meal, a southern summer supper would suit me just fine, and nothing goes with it quite like a glass of iced tea. My tea here is actually unsweetened but flavored with fresh mint, because my friend Deberah has been sharing the bounty of her garden, including gifts of mint as well as cucumbers, zucchini and squash. 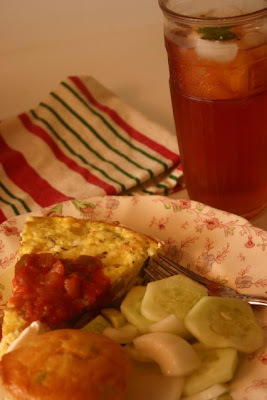 One of my favorite summer dishes is this Summer Squash Frittata recipe from Southern Living. 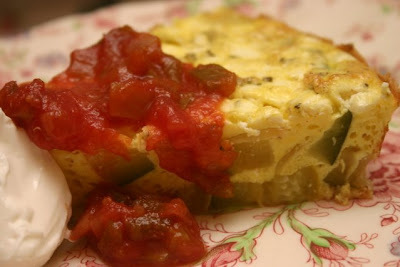 The frittata is easy to make, comes out beautifully every time, and is terrific with a little sour cream and salsa on the side. Speaking of "on the side," my other sides were Jalapeno cornbread muffins from the grocery store and Cucumbers with Vinegar and Olive Oil. 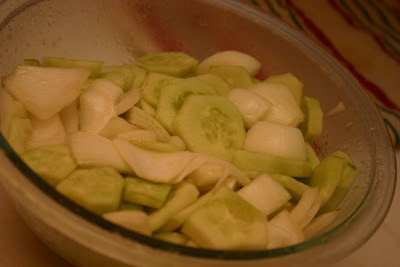 I simply slice three or four cucumbers and a small onion, add about 1/4 cup each of apple cider vinegar and olive oil, 1 tablespoon of sugar, and toss. Boy, this is good! DH and I have been eating this dish like crazy. 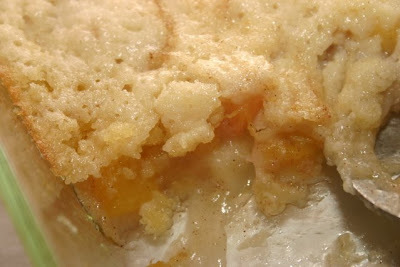 Finally, I had a few fresh peaches that have been around for a week and decided I would make a small cobbler. Can you believe I consulted five southern cookbooks and did not find a single peach cobbler recipe? That was shocking to me! So, I went online but since I couldn't find anything made with fresh peaches, I made up my own, and here it is. Preheat oven to 375 degrees and in a small (8-inch-square) glass baking dish, melt the stick of butter in the oven while it heats. Toss the chopped peaches with the cinnamon and two tablespoons of sugar and set aside. Combine flour, the 1 cup of sugar, baking powder and buttermilk. 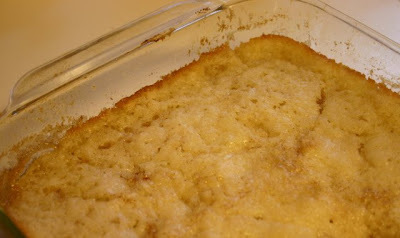 Once the butter in the baking dish has melted, remove dish from oven and pour in the liquid ingredients. Then, spoon in the peaches, spreading them evenly around the pan. Bake for 30 minutes. 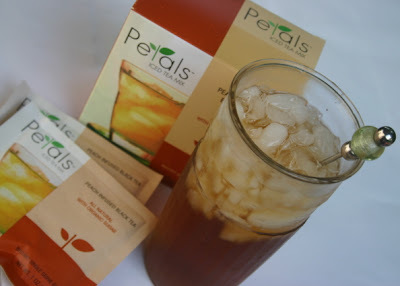 Enjoy with a glass of iced tea. Yum! "Why do they always have things just for you?" That's what my mom said to me Saturday in HomeGoods when I showed her the pretty new tea case I had just found. I am calling this a "case" rather than a "chest," but to be perfectly honest with you I'm not entirely sure WHAT this thing is! 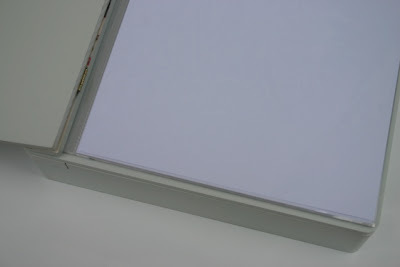 To give you some idea of the size and construction, here's a photo of the corner with the hinged lid. It measures about 10-1/2 inches wide, 11-1/2 inches tall and 2-3/4 inches deep. And here's the opposite corner, with some curious looking divisions. What IS this thing? Well, you open it to find what I at first thought were photo pockets, but there are no divisions for pockets. These plastic sheet protectors will hold an 8-1/2 x 11 sheet of paper, or anything else you can slide inside, I suppose, but there is not a seam at top or bottom. Maybe it's to hold recipes? 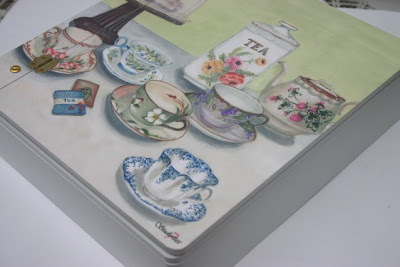 And once you turn the wooden "page" with the sheet protectors, you find an open case type construction, which I am going to put to use gathering up some of the many sample tea packets I've acquired this year. 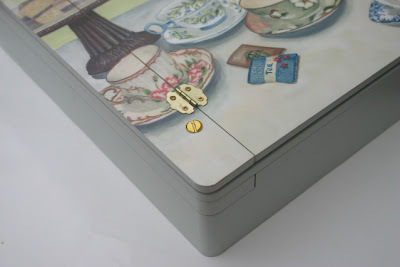 It could also be used as a "writing desk" to hold tea-themed notecards, stickers, bookmarks, etc. I thought this was a pretty neat and substantial piece for $19.99. There was (at the Cobb Parkway HomeGoods) another piece like this but it featured a design of shelves displaying pretty teapots. I opted for this one largely because it said "TEA," and this same design is also featured on what looked like a chest for teabags. It was smaller than my piece and cost more, $24.99. I imagine more of these items can be found at other HomeGoods and T.J. Maxx and More stores for you kindred spirits who might like one! But hallelujah, the hard-to-find Dong Ding has indeed arrived, fresh from China, so now I can get back to tasting my teas in order, like God and Michael Harney intended. And on a side note, today marks the halfway point for the year of tea tasting. I've already learned so much, I'm looking forward to the second half! Dry leaf appearance: HUGE balls of tea leaf with some stems apparent. 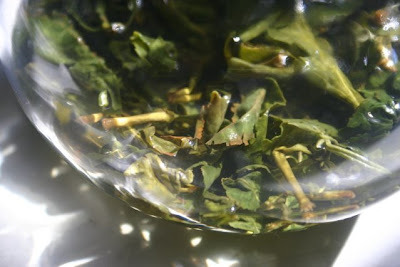 Wet leaf appearance: Large, whole tea leaves, with lots of stems now apparent. Scent: I had to sniff this for a long time before I realized the scent I was reminded of was boiled peanuts. Flavor: This tea didn't seem to bear any resemblance to the other oolongs I've been tasting. The flavor reminded me of Chinese greens, and with the 4 minutes of steeping I had quite a bit of bitterness and astringency. I steeped the leaves again for 3 minutes and found that cup of tea much smoother, with a nice taste, but it still had lots of "pucker" afterwards. I didn't hate it or anything, but this would not be a favorite. Additional notes: From the Harney book: "Along with Wenshan BaoZhong, Dong Ding is Taiwan's most famous and beloved oolong and most likely its first." 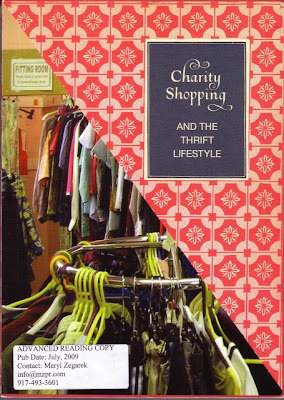 "Charity Shopping and the Thrift Lifestyle"
Do any of you read the British Country Living magazine? It is truly a beautiful publication, and though I don't buy it often, every now and then there's an issue so gorgeous I must (the June one is devoted to roses). For one thing, there is a feature on a Victorian railway station that was converted into a home, with the former railroad tracks now the site of a garden! But another tiny item in the issue is what really caught my eye. Titled "Eco Chic," it says this: "Britain is the developed world's largest market for secondhand clothes - charity shop sales are currently worth 550 million pounds a year and there are 7,000 charity outlets. 'Charity Shopping and the Thrift Lifestyle' by Lettice Wilkinson recommends the best, including those with tearooms. What better way to spend an afternoon?" 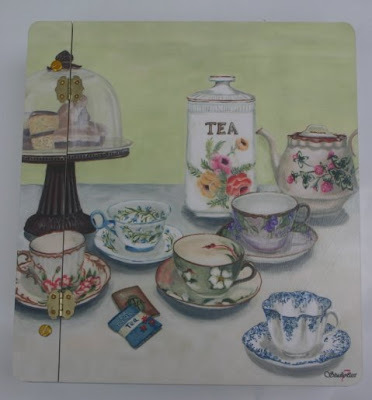 Thrift store tearooms? Excuse me? Well, the publisher (Marion Boyars) was kind enough to send a review copy, and I must say I absolutely love this book and the concept behind it. First, some vocabulary: What we call "thrift shops" to the Brits are "charity shops" and to the Aussies are "op shops" ("op" for "opportunity"). I've never heard of a guidebook to thrift stores, but what a marvelous idea! For a chapter on the Hospices of Hope Tearooms in Otford, Kent, the author describes the layout of the building, the array of goods for sale, and the variety of tearoom offerings: "Shortbread biscuits are presented in boiled sweet jars and under net-covered baskets at the counter. Homemade sponge cakes, loaves and flapjacks are kept chilled in a display-case fridge built in to the side of the counter, and a further tall, freestanding fridge opposite keeps the cafe well stocked with confectionary. Whole cakes and quiches are wrapped in cling film and stored in view with great care and efficiency." Photos are included for a good many of the shops, and Wilkinson writes her reviews with all the care and precision of a good restaurant critic. She describes the clothes at the Scarlet, St. Clare Hospice: "There is nothing that is not absolutely contemporary and no more than a couple of seasons behind from their brand shops. There are no unconventional pieces or vintage garments and nothing is old enough to look at all scruffy or particularly worn." She also discusses prices and the quality of the employees (often volunteers), and I can just imagine the British women marking up their books before making their charity shop rounds. If only we had such a useful volume here in Georgia! Just curious: How many of you would consider shopping at a thrift store with a tearoom? I know I'd love to! ... Christmas! At least if you're lucky enough to browse the Christmas ornament aisles at our brand spanking new Hobby Lobby where, I'll have you know, I was informed yesterday that I was the first customer to use a coupon. Got to love those 40-percent-off coupons! 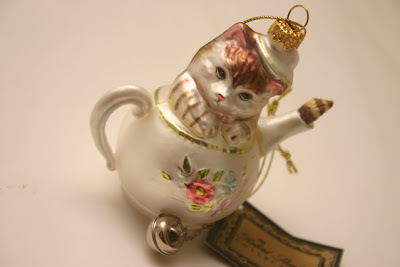 I do think June 24 has to be a personal best for my Earliest Christmas Ornament Purchase Ever, but I know from experience these glass teapot ornaments vanish quickly so I had to get one. Even the back of it is decorated! Cute, huh? There were two of these left after I got mine, although there were other teacup-design ornaments that were brown but they said "Java," and I just can't bring myself to put a "Java" ornament on my little pink teacup/teapot tree. 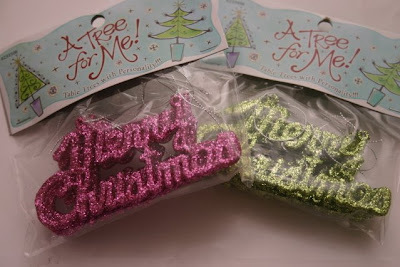 I did, however, get packs of these sweet 4-inch glitter ornaments because the pink and green decor items seem to disappear fast as well. The new store, by the way, is just lovely, and huge, and I'm sure I'll be coupon-shopping there quite often! Now I am such an anglophile I would pay simply to hear Linda speak for a while, but she immediately struck me as a gracious woman, very much a kindred spirit as far as taking tea (and a few other things), and I can already tell Newnan is going to be very blessed to have her in town. I learned an old church friend of hers is a friend of mine as well, and I was impressed when Linda spoke of having prayed over this business every step of the way. She also answered all my nosy questions without batting an eye (yes, colorful china; yes, she's going to have a cottage garden and a picket fence!). And can you believe she actually trained at the Atlanta branch of Le Cordon Bleu? I expected those scones to be terrific, and they were. You know how they say "we eat with our eyes first"? Well, my eyes were quite smitten with the appearance of these fluffy-looking scones. 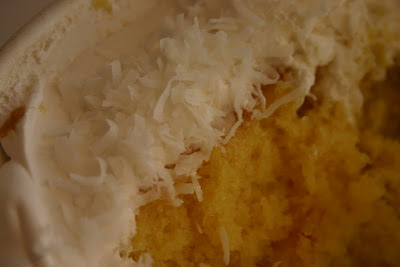 The consistency was so light and airy (even better than my own, which are pretty good if I do say so), and my husband and my friend Deberah liked the ones I shared with them as well. "That is GORGEOUS!" gushed Deberah when I offered her one of the scones. 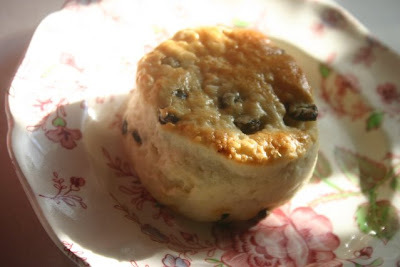 I asked for her to e-mail me her opinion, and here's what she said (and I concur): "The scone is really, really perfect, too! It is SO good. I couldn't wait and I can't praise it enough. It is almost kin to a very soft cookie. I think she might have added a very light sugar glaze which gave it just the right amount of sweetness without being too sweet. The currants were just the right size, not too big and not gooey. I can't see that there was anything to complain about and everything to praise. I really, really loved them! 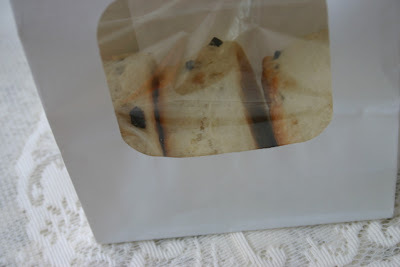 So often the scones we get here in tea rooms are really biscuits and these are just wonderful." (I think she liked them as much as I did, don't you!) 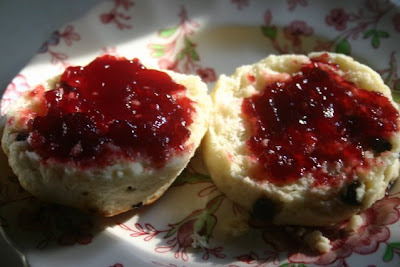 When I got home I heated one of the scones in the toaster oven and spread it with raspberry jam, making an already delicious scone even more enjoyable. Now, if I can just survive the next two months until the new tearoom opens! ... Phyllis! If you'll send your snail mail address to angela@newnan.com, I'll get the book headed your way. It's great to meet another "Friendship Teapot" participant! 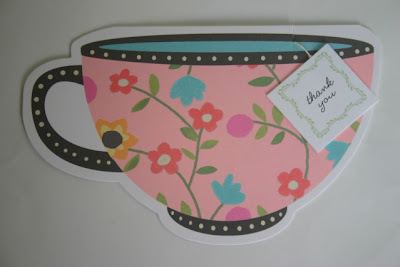 The last time I saw some teacup notecards was Christmas, so it's been a while and I'm nearly out of the cards (again). 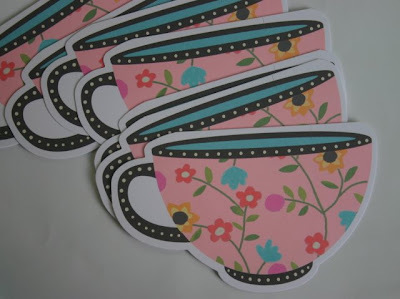 But I spotted a single package of these cheery teacup notecards from Hallmark at Publix last week (Bullsboro Drive location). It's $5.99 for a pack of 10, which isn't as great as T.J. Maxx prices but I've learned to grab these wherever I can find them! 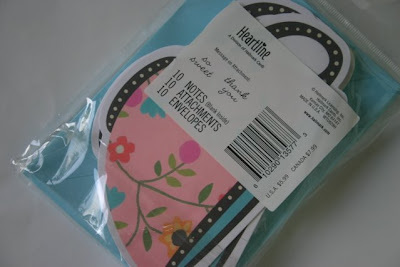 What I really love about these cards is that they come with little teabag-style tags that say "thank you" on one side and "so sweet" on the other, so you can personalize the card by selecting whichever sentiment you desire and tucking it into the slot in the card. Because these cards aren't packaged in a way that shows off the teacup design, I thought I'd show you what they look like in the package in case you want to scout out some of the cards for yourself. I for one will be looking for more of them at any place that sells Hallmark products, including my local Hallmark store. Cute, cute, cute! Today, dear friends, I need you to help lift me out of the depths of cooking despair. You see, the crowning glory of my Father's Day meal yesterday was *supposed* to be this Chilled "Watermelon" recipe I found in Woman's Day magazine and attempted on Saturday. You scoop out the fruit, freeze the watermelon shell, add a layer of lemon sherbet tinted green to simulate the rind, whip up the watermelon and a few more ingredients in an ice cream freezer, add mini-chocolate chips to simulate watermelon seeds, freeze it all in the watermelon shell, slice and serve. What could go wrong? Scooping out the fruit was easy, and I even managed to scoop out the pulp without breaking through the rind. Excellent. I froze the shell for 2 hours and sure enough, it was a rock, and ready for the "rind" of sherbet. So far so good. And that's when things went downhill fast. The sherbet didn't want to stick to the inside of the shell, so I scooped it all out, refroze the shell, re-spread the sherbet. 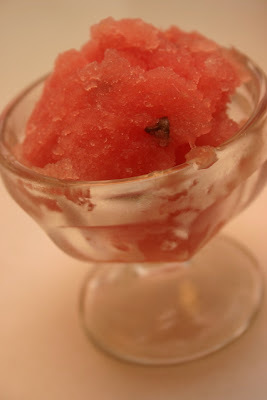 Outside, DH tended the watermelon mixture in the ice cream freezer, which after an excessively long time in the machine was the consistency of a Slushie. I put the stuff in the freezer to harden some more and eventually spooned it into the watermelon shell. On Sunday, even after letting it soften a bit I tried to slice it into those cute little watermelon slices but to no avail. A circular saw might have worked, but I have yet to see the dessert I'd risk a limb for. 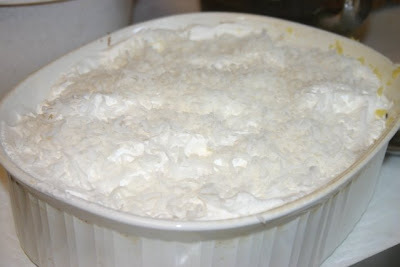 Blessedly, my sweet sister completely ignored my request not to bring anything for the meal and showed up with a perfectly delicious icebox coconut cake. (My seven-month-old nephew Matthew enjoyed the watermelon Slushie she managed to scoop out for him.) I will now use the new ice cream freezer to make Matcha ice cream and pray for a better outcome. Tell me about *your* most infamous recipe disaster before 7 a.m. EST tomorrow and you can win a prize of the new book "Victoria: The Essential Tea Companion." The elusive Dong Ding I ordered, it turns out, is being shipped from *China* and not the California office I assumed, and goodness only knows when it will arrive. 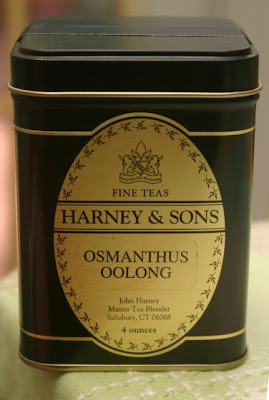 So I'm moving right along to the next tea on my list, Osmanthus Oolong. 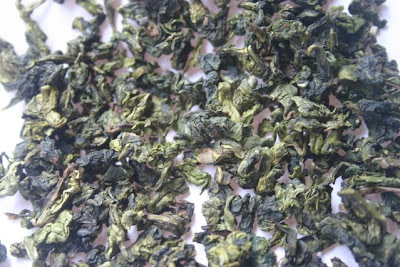 Dry leaf appearance: Large chunks of leaf with a few tiny bits of yellow osmanthus blossoms scattered throughout. 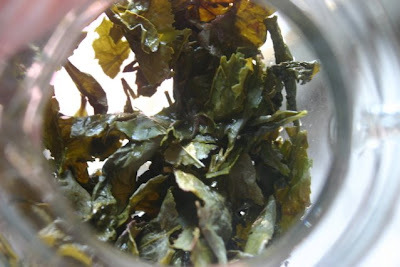 Wet leaf appearance: Large bits of tea leaf, but choppier and not as whole as with some of the other recent oolongs. 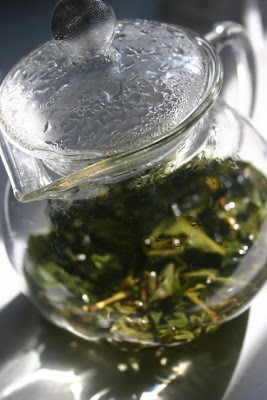 Steeping temperature and time: 1 teaspoon of tea, 205 degrees, 3-1/2 minutes. Scent: The wet leaf reminded me of something woodsy/earthy, and the liquid itself was almost reminiscent of the "roasted" scents in some of the green teas I tried. Interesting. Flavor: This tea definitely had a different characteristic than the previous oolongs I've sampled. That woodsy/earthy thing was present in the taste, and I was reminded very, very slightly of the puerhs I've tried. Just a bit. 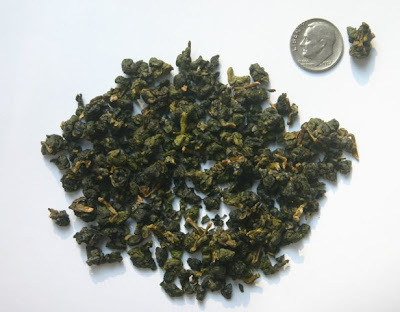 Additional notes: Michael Harney comments on what he calls the "ingenious" pairing of this lesser grade oolong (as compared with the Ti Guan Yin) with the osmanthus flowers. 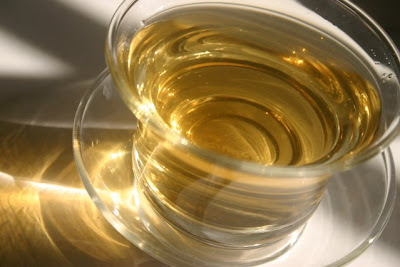 He says scientists have shown that "teas oxidized 40 percent or more, like this oolong, develop the same carotenoid aromatic compounds, called 'ionones' and 'damascones,' that form the classic apricot and cooked peach flavors in the fruits and in the osmanthus flowers. 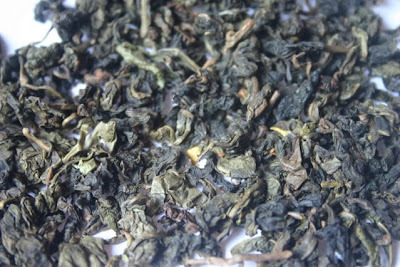 Osmanthus is a delightful, muted dark oolong, lovely for everyday drinking." A recent trip to T.J. Maxx resulted in a find that combines two of my loves: anything related to tea and anything with handwriting on it. 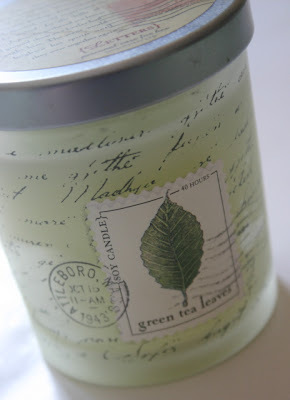 Although my "tea radar" is what usually kicks in first, this time it was the pretty glass jar with handwriting on it I spotted first, and the fact it was a "green tea leaves" candle simply sealed the deal. The candle, which has a nice light and clean scent, comes in this jar with a brushed metal lid. 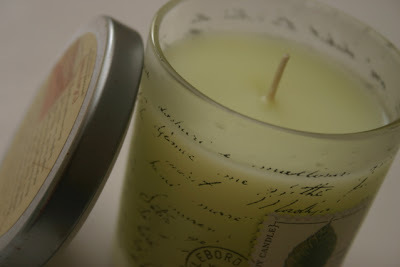 The website for the maker, mangiacotti.com, didn't seem to be working properly, but with further web surfing I found a vendor who described this candle as one which will burn for 40 hours soot-free. 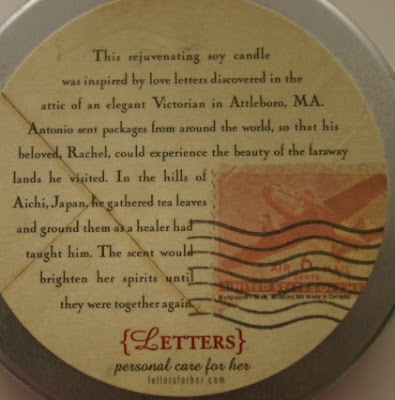 I love that this design was inspired by love letters discovered in an old attic. On the lid above is the lovely legend regarding this piece. If you have an extra minute I hope you'll read it because I think you'll like it! Historians tell us that teapots have been around for centuries, but I have wondered how long teapot *stuff* has been around. When did the little iconic image of a teapot become so popular, so familiar, that some marketer thought it was a good idea to add the design to a tablecloth, or a brooch, or, in this case, a pair of curtain tie-back holders? These little wooden tie-back holders, a tad over 1-1/2 inches tall, would be prettier if they had roses on them, to be sure, but I had to have them for the curiosity factor alone. (That, and the fact they were just $1.99.) Can't you just see some fifties housewife using these in her "Florida room" to brighten the decor? 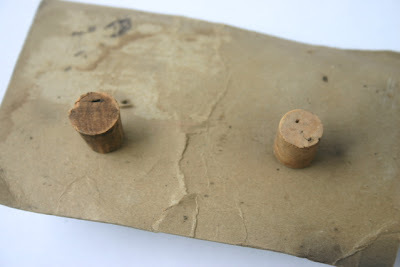 The metal pin on the back fits, like a pushpin, into these small pieces of cork and once pierced layers of fabric, or at least was intended to. I don't think I have any curtains these would, um, beautify, but I am thinking these may serve as "hooks" in my craft room sometime in the near future. 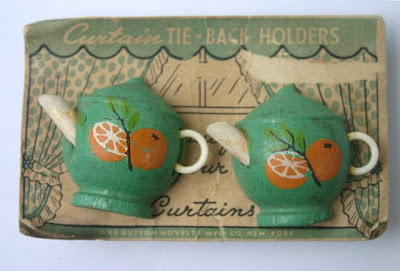 Teapot curtain tie-back holders. Who knew? Newnan is getting a tea room!!! News flash! Thanks to Maureen, I learned Newnan is finally getting a tea room! Go here to find out more. 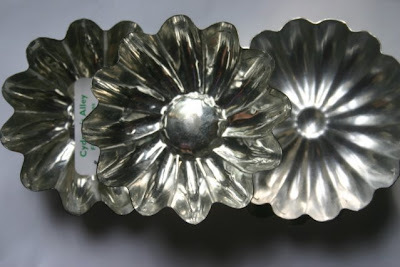 Three seemingly random events: 1) My friend Liz opens an antique store, I spot six cute vintage flower-shaped metal molds, and she tells me just take them. I do. No idea what I'll use them for. 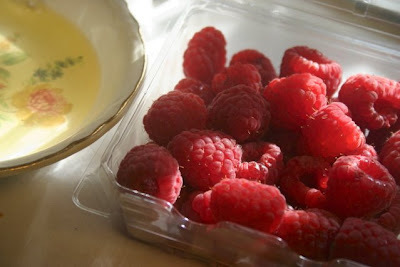 2) Almost a year later, and I notice raspberries are on sale at the grocery store. I buy some. 3) The new issue of Tea Time magazine has a recipe for Raspberry Financiers (teacakes) that appear to be made in the very molds I now own. Coincidence? I think not! The Tea Time recipe looked pretty easy, but alas, it called for several ingredients I didn't have on hand, like almond flour and a vanilla bean. So, I researched financiers several places online, experimented with a few substitutions, and halved a recipe I found for 12 (since I had just six molds). 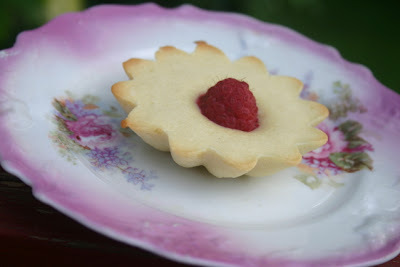 These turned out just lovely and tasty, especially with the warm raspberry flavoring it all. DH also said he thought they had a very nice texture (sort of spongecake-like). So here's the recipe for my "cheater" financiers! 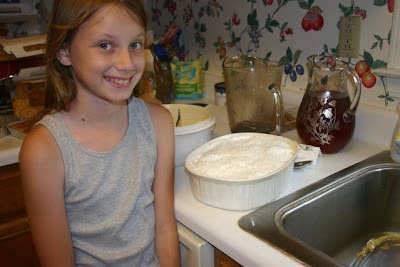 Meanwhile, add the sugar, flour and salt to the bowl of a mini-food processor and pulse a few times. Once the butter cools, add butter, egg whites and almond flavoring. Process until mixture is well blended. This will be a thin batter. Spray molds with cooking spray and spoon about two tablespoons of batter into each. 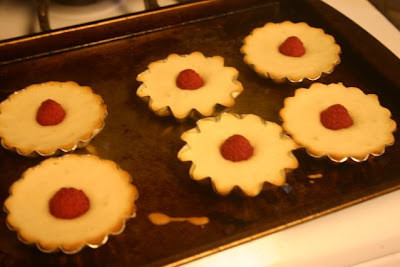 Place a raspberry in the center of each mold and cook for about 15 minutes or just until they start to brown around the edges. Yields 6. The random number generator has been consulted, and ... drum roll, please ... our earring winners are Susan T., ParTea Lady of Tea Talk, and Marilyn Miller of Delights of the Heart! Congrats! Susan T., I believe you're the only one whose snail mail address I don't have, so if you'll send it I'll get everyone's earrings headed your way! As a magazine editor, I find that one of the nicest compliments I ever receive is when someone tells me they save every issue of our magazine. The only two magazines I have *every* issue of, besides the one I edit, are Victoria and Tea Time. Do you save *every* issue of any magazine(s)? If so, I'd love to hear your list! I just got the latest Tea Time and found it to be one of the best in recent memory. But then perhaps I am simply smitten with the article titled "Just Peachy," which features recipes made with peaches. You know how sometimes all the teatime recipes in a book or magazine start to look alike? Well, this one has some that seem very fresh and original, like the Peach-Ricotta Tart with Rosemary-Cornmeal Crust and the Prosciutto-Wrapped Peaches with Spicy Glaze. And you know how we have enjoyed exploring words like craf-tea, par-tea and sinceri-tea? 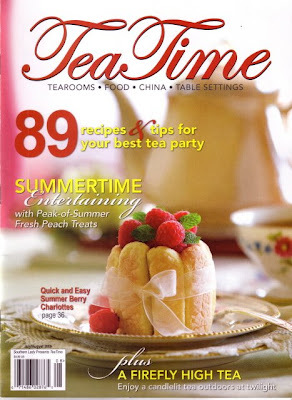 Well, this issue of Tea Time offers a suggested menu for a "Novel-Tea" for our book-lover friends. I'm just sorry I didn't already think of that idea myself! The photo and recipe for the Chocolate and Pistachio Cookie Bookmarks is reason enough to get this issue, but then I think Tea Time is a must-read for tea lovers all the time. Let's begin this week with a giveaway of a different sort, shall we! 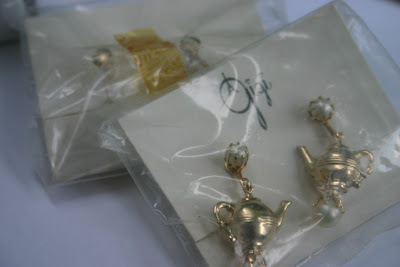 I don't think I've given away any vintage tea-themed jewelry, and it's high time I do so. You know how I've mentioned buying some things on Etsy every now and then? 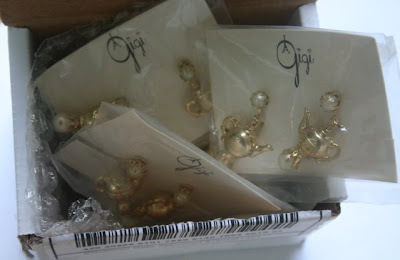 Well, they recently had some teapot earrings I wanted but I had to buy a whole box of them. The price was right ($7 for all), and I remember at the time thinking I would give some of these away if they arrived in decent shape. 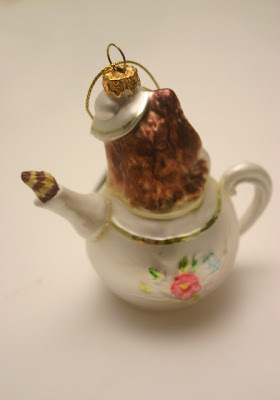 The earrings were listed as plastic but they aren't -- they're metal, just like the other half-dozen or so pairs I have with this same teapot design. The pearl ("pearl") embellishments are an interesting addition, and I think they're quite cute in a kitschy kind of way. 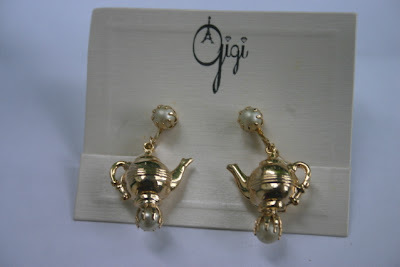 Displayed on the original "Gigi" card, these earrings have the old-fashioned screwbacks on them, and you can even see how the original tape has yellowed over the years. 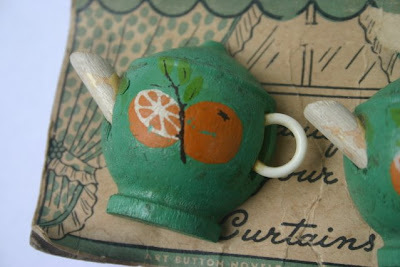 Even if you never plan to take them out of the package, they might be cute with a tea-themed display. Or for your daughter or granddaughter or niece or little friend next door to play dress-up in. Or for altering into a new piece of jewelry or craft. Whatever, I just know I will enjoy seeing these go to good homes where they will be appreciated in some way! I'm giving away three pairs of these, so you've got a better-than-average shot at being one of the winners if you leave a comment before 7 a.m. EST tomorrow. Happy Monday, everyone! No Dong Ding? Well dang! 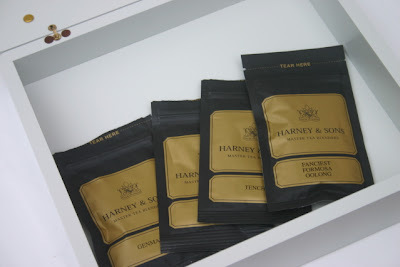 I thought I had a sample of Dong Ding in my recent order from Harney and Sons but realized only last week I didn't. 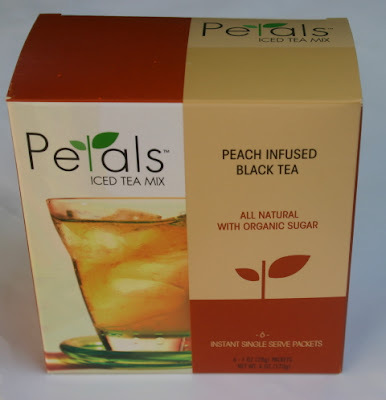 Turns out this tea is currently unavailable from them, so I ordered it from another vendor and it has yet to arrive. So "Tea Tasting Saturday #24" is really "Tea Tasting Saturday #25" according to the order in the book, but I hope you'll stay with me just the same! Dry leaf appearance: Chunky Monkey! I know that's a famous ice cream, but that's also the name that came to mind when I saw these huge bits and bobs of medium and dark green chunks and balls of tea in my sample packet. And it must be said this was also a noisy tea! When I dropped the spoonful of it into my little glass teapot, there was a distinct *thud* I don't ever remember noticing before. Wet leaf appearance: Large, whole tea leaves clearly identifiable as leaves but with some pretty raggedy-jaggedy looking edges. Scent: This tea had a hint of ... wait, wait, I know that fragrance! And I've smelled it very recently. 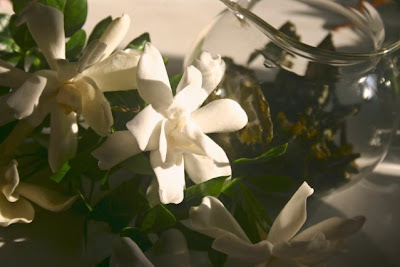 Ah, gardenia! That is IT! Color: Pale deep gold. Does that make sense? Maybe it's because I was viewing it in afternoon sunlight, but it struck me as wrong to simply call this color "pale" gold, because there is definitely some color and depth there. I like it! Flavor: Oh my, this stuff is good! It has the merest hint of a floral taste (nowhere near as powerful as jasmine). If jasmine tea is rather like a fresh, somewhat brash young southern lady, then Ti Guan Yin is the older, richer aunt in the Chanel suit and pearls. Very rich and full "mouth feel." No astringency. Delightful, even to the second and third steepings! 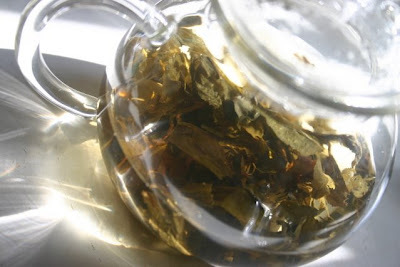 Additional notes: I had always wanted to try Iron Goddess of Mercy tea -- the name alone, which comes from a Buddhist myth, is pretty impressive -- and I honestly had no idea Ti Guan Yin was she! (Can a tea be a she?) To be honest with you I was a bit aggravated I was going to have to break my "perfect record" of sampling teas in the order in which they appear in the book, but I must say, could there have been a better week to sample this gardenia-scented tea than the week in which our gardenias are at their peak? I think the "God of Mercy" was looking out for me here! Next week's tea: Dong Ding, maybe??? Do you love the fruits of summer as much as I do? I love to see fresh peaches and berries show up in the markets and grocery stores, and I think my tastebuds are more frequently drawn to fruit and fruit-flavored drinks at this time of year. I enjoyed the new peach milkshake I had at Chick-fil-A this week, and I also liked the new Peach Infused Petals Iced Tea Mix I picked up at Fabulous by Design in downtown Newnan yesterday. I'd seen this new (to me) mix at T.J. Maxx but thought it was a bit expensive for the box of just six packets. Turns out it's currently half off at FBD (marked down from $7.50 to $3.75), and while you're making up your mind which of the flavors to buy you can also browse the gorgeous fabrics and, a surprise find, bolts and bolts of beautiful vintage trims. I can't seem to remember to read the label before buying new teas, so I was a bit surprised to find each packet contains 23 grams of sugar. But it's all natural, organic cane sugar, and I love the convenience of being able to make just a single glass of iced tea when I want. So I would definitely buy this tea again, I just won't drink it every day! This tea was prepared in my favorite tea glass, one of only two remaining from the set of four I found at a Hallmark store many years ago. Can you see that it says TEA on the glass? If you turn it around, it also says TEE and TE' and THE'. I've seen green glass versions of this at World Market (think "pale green" like the color of a Coca-Cola glass), but I've never been able to find clear ones again. If I ever do, you can bet I'll stock up! 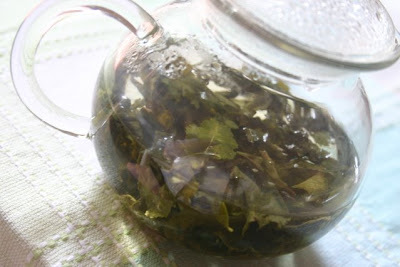 Green tea in the "apothecary"
It's time to "Think Pink"!